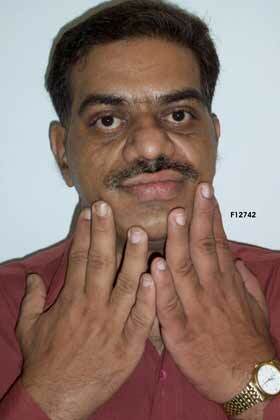 Acromegaly is a serious condition that is nearly always caused by a tumor of the pituitary gland (an adenoma). The tumor cells secrete an excessive amount of growth hormone (GH). The pituitary gland (or in this case, the tumor) releases growth hormone into the blood stream. Growth hormone acts on special liver cells, causing the release into the blood stream a hormone called Insulin-like Growth Factor (IGF-1). IGF-1 is also called Somatomedin-C. The symptoms of acromegaly result primarily from the overproduction of IGF-1. 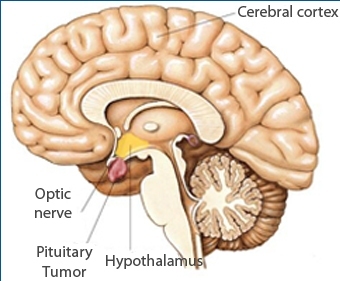 Large pituitary tumors (macroadenomas) can cause additional symptoms related to compression of the optic nerves or chiasm (crossing point of the optic nerves). This can cause loss of peripheral vision (bitemporal hemianopsia). Macroadenomas can also compress the normal pituitary gland, causing pituitary insufficiency (loss of pituitary function). 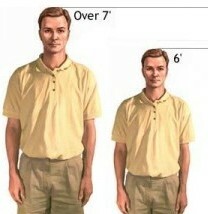 The most commonly notice symptom is abnormal enlargement of the hands and feet. Rings no longer fit. Enlargement of the feet may require increasingly larger shoe size. The distal fingers and toes are widenned, sometimes referred to as “paddle” toes. The hands feel soft and doughy. Changes in facial features are also common, and sometimes quite prominent. This can include enlargement of forehead and jaw with pronounced under bite, spreading teeth and enlarging tongue. The nose and lips may enlarge as well. The changes in facial features occur slowly, and often disregarded for many years. Changes of the skin are common in acromegaly. These include an increased number of skin tags. There may be oily skin and excessive sweating. If the tumor develops before bone growth is completed (in childhood), overdevelopment of the entire body (gigantism) is the result. Pituitary giants can grow over 7 feet tall. An elevated IGF-1 is usually required for the diagnosis. IGF-1 levels vary with age and gender, and therefore it is important to use the correct control values. In unusual cases (typically pre-menopausal females), the GH levels can be high with a normal IGF-1 can be normal. This is thought to be an estrogen-resistance type phenomena. A glucose tolerance test is often perfomed to confirm the diagnosis. Drinking 75 grams of glucose solution lowers blood GH levels to less than 1 nanogram per milliliter (ng/ml) in healthy people. In acromegalics, this suppression does not occur. In fact, sometimes GH levels increase. The vast majority (90%) of GH-secreting tumors are macroadenomas. The surgical removal of the tumor offers a chance for cure. Most of the tumors can be easily removed in total by transnasal transhenoidal surgery. 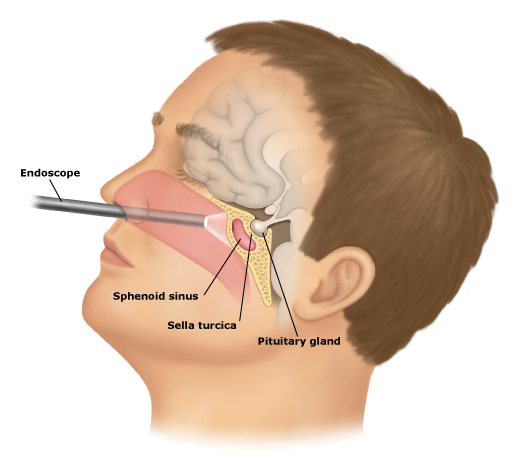 We generally use endonasal endoscopic approach to the sella. Sometimes microscopic approach is also used. Tumors that have invaded beyond the confines of the sella (the space where the normal pituitary gland sits) have a lower chance of cure surgically. In the past, invasive tumors were considered noncurable. Newer surgical techniques, such as theexpanded, endoscopic endonasal approach have now allowed surgeons to cure some of these tumors. Somatostatin analog (Octreotide, Lanreotide) injections (typically administered monthly) suppress GH production in about 70 percent of patients, cause significant tumor shrinkage in 30 percent to 50 percent of patients, and often improve symptoms of soft tissue swelling, headache, joint pains and sleep apnea. Other therapies include drugs which block the action of growth hormone at its liver receptor, thereby normalizing IGF-1 levels. Pegvisomant, a daily injection, is an example. Dopamine agonists (same ones used to treat prolactinomas) are sometimes tried, but effective in only a minority of patients. 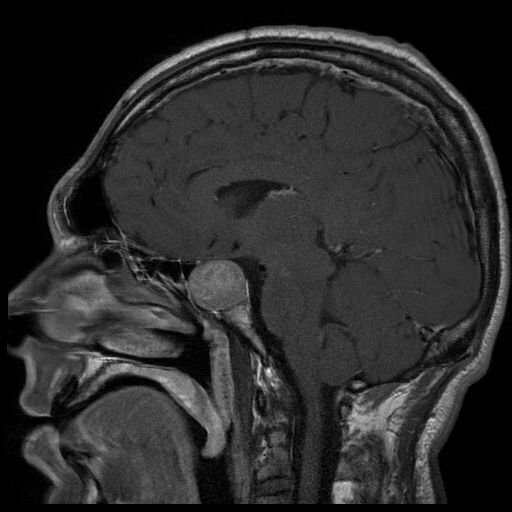 For patients whose acromegaly cannot be controlled by surgery or medicines,stereotactic radiosurgery can be effective in some cases. The lowering of GH and IGF-1 levels takes an average of 18 months with stereotactic radiotherapy. In general, the higher the pre-operative GH level, the lower the chance for cure. Long-term cure of acromegaly after transsphenoidal surgery is seen in approximately 80 percent to 85 percent or patients with smaller tumors (microadenomas) and in approximately 50 percent to 60 percent of patients with larger tumors (macroadenomas).